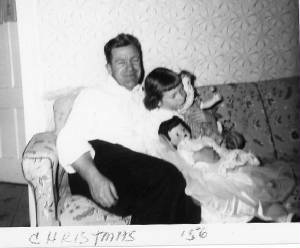 I have not been able to determine the date of these dolls that were put out with the very soft body. They usually show up as a beautiful dark-haired brunette, or a vivid red-head. Either way they are called Betty the Beautiful Bride, and have all the same accessories as the one put out in the 57-58 era. The soft bodied one has flat feet with soft soled shoes and a different gown, but the same tiera, plaque of a church stained glass window, and the 45 record of Bing Crosby's Because. Here is my beautiful brunette Betty the Bride. I picked her up because she was a brunette, but these older dolls have real problems, as you can tell in the picture below. It shows on the box, the body is made of rubber, and it really disintigrates from the weight of the head on it. I have seen some of them that have never been played with, and even the body is giving way. My sister received one mint in box, and was afraid to even lift her out for fear it would damage her. Her's was in much better condition than mine, and mine sits on a vanity stool for display. I just don't move her much. Here are the stress marks from the weight of her head showing on this doll, and a lot of her "sisters". Here is the front and back of her dress, really simple compared to the later versions with the rows and rows of lace on the high heeled dolls. 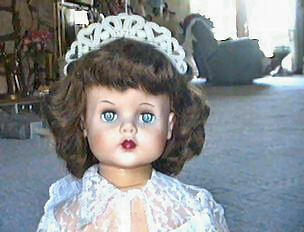 I have to get my doll out and get a better picture...this one just doesn't show her fantastic hair! There seem to be two different boxes for this soft bodied Betty Bride. 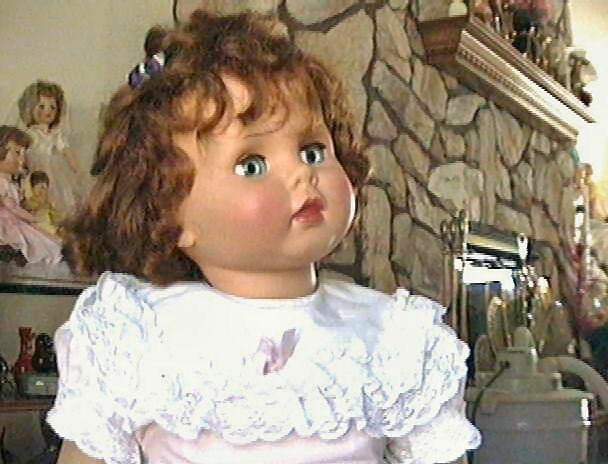 This one showed up on ebay with the dark-haired doll. I wonder what the verbage on the box is, and how different from the lighter colored box. 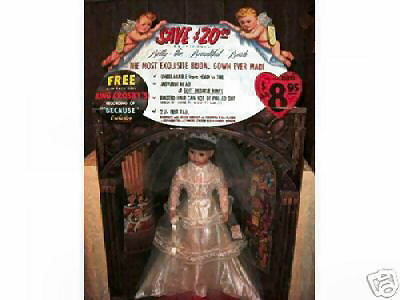 Here is the display box for the Soft Betty Bride. There are a couple of choir boys in the front of her dress, but the picture is not really clear. Thanks to Becky for sharing her display picture. Here is the basic body of this doll. Nothing fancy, no bust line, and just flat feet. 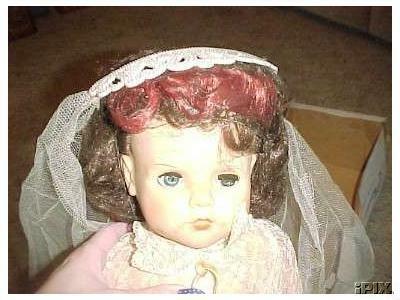 The hair on this Betty that was on EBay, makes me wonder what happens to the hair with age...is that where we are getting the fabulous red-headed dolls, from a reaction to age or chemicals?